Description	 MS in Sahidic on limestone, Egypt, 7th c., 1 limestone, 22x17 cm, single column, 40 lines in a sloping Coptic uncial. 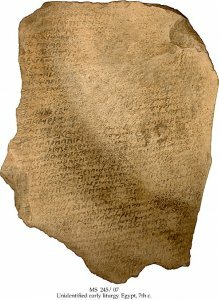 Commentary	 A rare and unusually long liturgical text on a rough slab of limestone, that will require more research. See also	 MS 096, Antiphonal, France, late 9th c.